Limited spots available on this popular New Year's Eve event trip. Golden Roof ... Hofburg ... Olympic Ski Jump ... Austrian desserts ... New Year's Eve on Cloud 9 ... 6000ft above Innsruck ... New Year's Eve light show ... Swarovski's Kristallwelten ... Group winter olympics including tobaggoning ... and much more!! 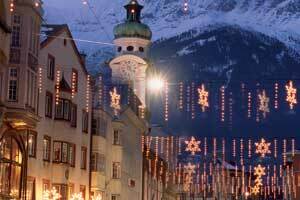 Come celebrate New Year's Eve in the Austrian Alps, high above the city of Innsbruck. Travel back in time, strolling down the charming narrow streets of the Old Town, exuding a special charm and sophistication that is unique in the Alps. Enjoy the festive atmosphere in the city, taste roasted chestnuts or enjoy a cup of hot chocolate in a fashionable café. Take part in our very own Winter Olympics on the mountain, then ring in the New Year over 6,200 feet above sea level at “Cloud 9” – an igloo club with stunning views of the city and the New Year’s Eve laser show. Bring your friends. You don’t want to miss out on this one!! Our Europe-bound jet heads for Munich, Germany. Transfer to Innsbruck upon arrival at Munich airport. For travelers with AESU airfare, the tour director will meet you in the arrivals hall at Munich airport for your group transfer to Innsbruck, the capital of Austria’s Tyrol region. Take some time to rest up or start exploring the medieval old town, with spectacular views of mountain ranges, palaces and cathedrals. Tonight, join us for a welcome dinner of Austrian specialties and a program orientation with your tour director. Join us on the mountains for our very own Winter Olympics. A snow shoe hike will take us off the beaten path with fresh snow clinging to mountain peaks, spectacular views, and maybe even some wildlife sightings. After discovering our inner Inuit by building an igloo, we have earned a hearty meal in a ski hut on the mountain top. Then bundle up in hats and mittens to whiz down the mountain on a sled. If you would like to ski or snow board on your own, talk to your tour director about equipment rental and ski passes. On this morning's tour of Innsbruck our local historian takes us to the very center of Innsbruck to the famous ‘Golden roof’, decorated with 3,000 fire-gilded copper tiles. We pass the famous triumph gate of Innsbruck, ‘Hofburg’ Imperial Palace including the ‘Hofkirche’ chapel, then visit the Olympic Bergisel Stadium and Ski Jump, with the most amazing views over Innsbruck and the Inn Valley. Our final stop is Ambras Palace, built by Archduke Ferdinand II half a millennium ago. After a walk in the castle gardens, we return to town for a coffee and some of Austria’s legendary pastries at a traditional coffee house. Get ready to ring in the New Year in style. Our gala dinner is only the beginning of tonight’s celebration. After a feast of Tyrolian specialties accompanied by local wines, we take the Nordkettenbahn cable-car to ‘Cloud 9’ an igloo club with exclusive views of the New Year’s Eve laser show. In a setting over 6,200 feet above sea level, chill out and dance the night away at the club featuring some of Austria’s hottest DJs. Happy New Year! After a hearty breakfast, we make our way to Kristallwelten, Swarovski’s fascinating museum, a fairy-tale world of shimmering crystal. Travel through ’14 chambers of wonder’ featuring marvelous paintings and sculptures such as the crystal tree or the giant ’crystaloscope’, created by world-famous artists. Let’s toast to the New Year with a glass of champagne before heading back to town with leisure time to shop or relax before our farewell dinner at a rustic pub tonight. Bid farewell to new-found friends and make plans for your next young alumni adventure. Travel home today with fond memories to last a lifetime and lots of energy for the New Year. Looking for something sweet? Konditorei Munding is a patisserie in the centre of Innsbruck that offers delicious treats and sweet “Golden Roof Tiles”. Zimt & Zucker also offers “Golden Tile” treats and Konditorei Pichler and Arko, located under the arcades, are home to delicious chocolates and sweet delights. The famous “Sachertorte” chocolate cake can also be enjoyed in Innsbruck – Café Sacher by the Imperial Palace sells them nicely packaged to take home. Some of nature’s sweet delights can be found at the Tiroler Bienenladen (Tyrolean Bee Shop) on Meranerstrasse and at Tiroler Wachszieher und Lebzelter behind the Golden Roof on Pfarrgasse. Enjoy the scent of beeswax, cinnamon and honey while admiring the lovely selection of colourful products – a treat for multiple senses. 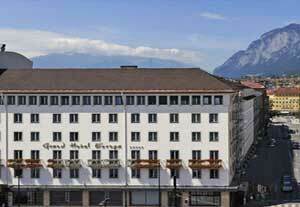 The Rolling Stones, Sting, Queen Elizabeth II and the Prince of Monaco have all stayed at the Grand Hotel Europa in Innsbruck. Rooms feature modern furnishings, marble bathrooms, a flat-screen TV with satellite channels, air conditioning and Wi-Fi. Large windows with views of the surrounding Alpine landscape are featured in many. Grand Hotel Europa's restaurant Europastueberl offers traditional Tyrolean cuisine. * Price per person based on a twin share room. If you're traveling alone, and do not want to pay the single supplement, AESU will attempt to arrange a share with a same-gender traveler. If no travelers are available to share, a single supplement of $425 will apply. Email Austria to a friend!